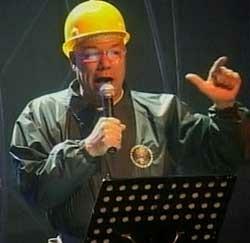 Colin Powell Joins Village People! The Associated Press reports our that our respected Secretary of State performed his very own rendition of the Village People's beloved classic "YMCA" live onstage at the ASEAN Regional Forum recently. He got dressed up with five of his colleagues from the State Department and blasted out the number, presumably including obligatory alphabetic gesturing, at the conclusion of the meeting in Jakarta. 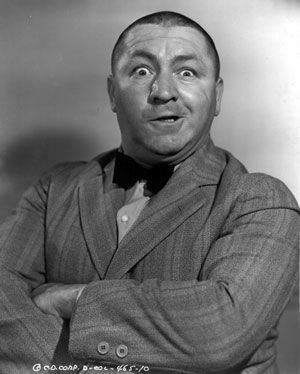 The reports didn't indicate why one of America's few remaining dignified public figures saw fit to remind the world of our baser cultural instincts, but maybe he was just in a good mood, drunk, jet-lagged, bored, or all of the above. Either way, it must have been one hell of a show. 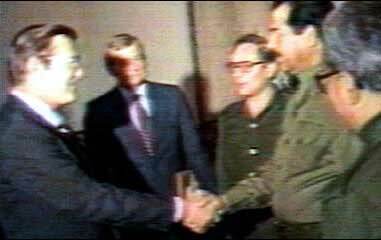 Rummie and Saddam Do "Almost Like Being in Love" - This was a rare find. I'll bet you never thought these two guys ever got along. But they did, once. Who says history doesn't repeat itself? All it takes is a little happy talk and a show tune (and maybe a shared national interest, like mutual hatred of Iran), and everybody's ready to let bygones be bygones. Who can stay mad during Okahoma! Even a high school production warms the heart. The Secretary was reportedly in good company. The Russians did Yellow Subarine. A little boring, but still spunky for Russians. They couldn't help themselves, though - while they did their bit they had a woman with a Russian flag running around amongst the dinner guests. Even we're not that bad. No word on whether the frolics, which are apparently intended to lubricate the otherwise stiff diplomatic process, resulted in any breakthroughs. But the North Koreans do seem to be slightly less obstinate lately. And the Chinese haven't been threatening Taiwan with any flaming blasts from hell. Maybe they've been using up all their nasty rhetoric on the folks in Hong Kong. Arafat and Sharon sing "Give Peace a Chance" Duet - Well, you can tell I've violated one of the first priniples of the site by splicing these guys together with my PC (I try to be authentic). I'm afraid that may be the only way to resolve this time-tested conflict, but modern technology does have it's advantages. Why not simply digitize both of them - get them out of the real world altogther - and see if they can work out their differences in cyberspace? I won't let them out of my hard drive until peace is at hand for real. And I can make it pretty uncomfortable in there. Ever see "Tron"? I'm sorry to say, I have. They will be too. SPECIAL FOURTH OF JULY EDITION! 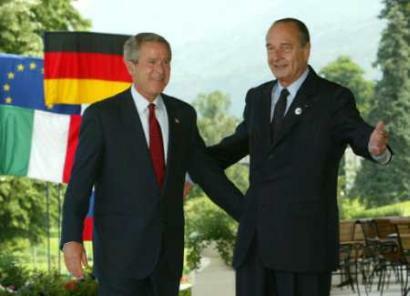 W and Chirac do "Love Hurts" - Anybody remember Nazareth? I'll bet if somebody mentioned the word to W he would think a hymm was involved and step right up to a joint performance with his nemisis from across the pond. I guess Chirac will do anything for a laugh. Ooops. Sorry Mr. Pres - you just sang a maudlin tune by a second rate band from the seventies. Oh well, another nail in coffin for NATO.